Even though the Sandokan character is sometimes known as a pirate his adventures often take place on dry land and in the case of SANDOKAN THE GREAT the story for this Steve Reeves production takes place entirely in the jungle. Like most stories of this series of books, this Sandokan film is basically a Jungle Adventure. Anyone not familiar with the character will wonder where the boat on the DVD cover fits in in the plot after watching the film. 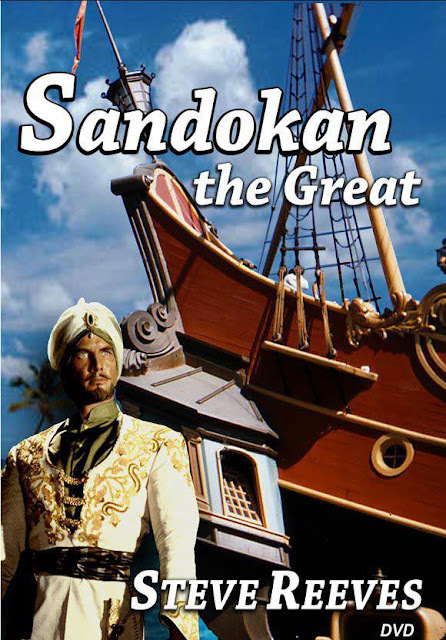 The Sandokan Movies take place in the late 19th Century,and during that time the ships they used were Windjammers and Steamships mostly. The ship shown in that cover seems to be out of place by a couple of centuries.